It's 1987. 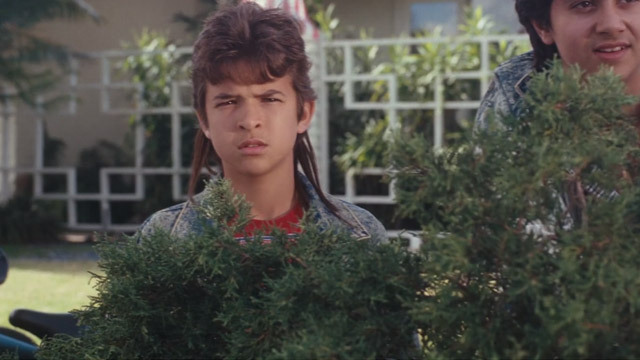 Infatuated with the hottest girl in school, sixth-grader, Cameron, puts everything on the line - including his mullet - to win the girl of his dreams. Starring Hailee Steinfeld. When it comes to features, 2013 may go down as the year of the coming of age film. From The Way Way Back to The Spectacular Now to The Kings of Summer (from short success story Jordan Vogt-Roberts no less), this year has seen no shortage of awkward boys coming to terms with their adolescence. And, although Cameron Sawyer’s short She’s a Fox was made back in 2009, since it only just made its way online, I’m going to cheat a little bit and say it’s another fitting addition to 2013’s youth centric milieu. As much a love letter to the eighties as it is a story about budding hormones and young love, Cameron Sawyer’s film is a warm, delicious sandwich of nostalgia laden goodness. This is a short that wears its references on its sleeve—from rattails to roller skating rinks. The result is part Wedding Singer, part Wonder Years—a decidedly humorous look at a clueless boy doing all he can to attract the foxy classmate of his dreams. Fortunately, this semi-autobiographical tale never gets lost in the quagmire of surface level pop culture winks. Rather, it tells an honest story (albeit comedically heightened) about love, loss, and learning to move on. As a kid, every event—especially a matter of the heart—feels devastatingly significant. With this film, director Cameron Sawyer seems to suggest that one’s transition to adulthood is as much about getting over stuff as it is about experiencing it in the first place. The heartbreaking crush isn’t as important as the heartbreak and its ruthless aftermath. It’s the stuff that many a mopey mix tape are made of. Shot on film with a budget of around $30K, the production values of the film are stellar to be sure. But of course, it would be a bit gauche to ignore the short’s star pedigree. The titular character is played by none other than True Grit Oscar nominee Hailee Steinfeld. While her appearance in the film predates her a-list status, she ’s a notable presence—the goddess yin to our protagonist’s “average kid” yang. We understand why lead Jake Nutty is willing to change himself for her. I mean, she is a fox after all. Sawyer has just finished a feature script for a semi-autobiographical high school comedy about an impeached student body president vying for a scholarship to the college of his dreams. As Sawyer relates, “It’s set in the early 90’s and is based on my experiences as maybe the worst Student Body President in my high school’s history. I’ve got a Line Producer attached and some interested investors, but I’m still looking for Executive Producers.” Hmm…has he tried praying? I saw somewhere that that particular technique can reap dividends.